I've been toying with the idea of starting another blog for quite a while. Colin Griffiths is a frequent and prolific Blogger with several interesting sites. His Lubbesthorpe Bridle Road and Croft Hill blogs are exactly what I have had in mind for my own monograph which will run in tandem with 'Hard Light'. 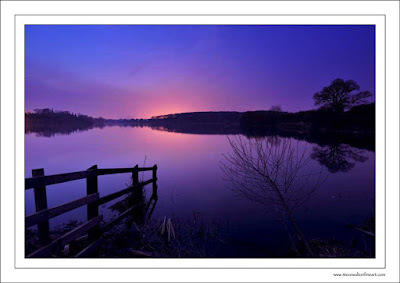 Thornton Reservoir has been a sanctuary for me for many years. I once lived in Thornton, my children were raised there and Joe, my youngest son, still lives in the village. Since I moved to Markfield, the 'res' is very close once again and I have been re-aquainting myself with the peace that I find there. Thornton Reservoir is the subject and title of my new blog and I shall be updating it frequently. My aim is to record the flora and fauna and the changes that this area continues to experience. So, an evening walk around Thornton Reservoir with my camera this evening spurred me on to begin my 2nd outdoors blog. The image above was taken this evening on the D3 with 14-24mm at f5.6. Exposure at 200 asa was 10 seconds. I hope you enjoy your visit! Thanks for your kind words. I'm really pleased that you've started your project. It will be interesting to follow your journey and I'm sure that you will provide us with lots of inspiration along the way. Colin, thanks for dropping by. I hope you can find something of interest in 'Thornton Reservoir' over the coming months. That's a beautiful picture. It has most of my favorite colors in it. I also applaud the idea of multiple blogs. I have two of my own, three if you count the OBS blog, and they all cover different aspects of my life. It's nice to have several places in which you can share your thoughts. Thanks, Kristine. I know what you mean and I'm looking forward to developing the new blog alongside this one.